You’ve no doubt by now, heard me talk about a great website called The Family Dish. 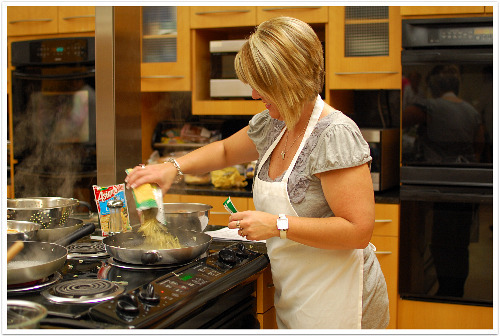 It’s full of great recipes and is all about bringing your family together in the kitchen. I’m proud to say I’m an Ambassador for this Unilever program. As part of the program, Unilever brought us to New York City to see the Unilever kitchens, and talk and cook with their experts. We met Lauren and Anna Marie of @KitchenDishin on Twitter as well as many other amazing Unilever kitchen experts. These ladies were so full of passion and truly LOVE their jobs……..and oh how I would LOVE their jobs!! I will share more about the trip over the next week or so, and I will share more of the recipes we prepared that day. But for today I wanted to share the dish I prepared in New York City in the Unilever Kitchens. We each prepared a dish with the experts, then presented our dishes to the group then we enjoyed all the food! My dish was Moo Shu Pork with Chow Mein Noodles- people! this was SOOOO easy and fun!! Thanks to Linda Sellers for this picture. Season pork, if desired, with salt and ground black pepper. Heat 1 tablespoon oil in 12-inch nonstick skillet over medium-high heat and cook pork, stirring occasionally, 4 minutes or until done. Remove pork and set aside. Heat remaining 1 tablespoon oil in same skillet over medium heat and cook coleslaw mix, stirring frequently, 6 minutes or until tender. Season, if desired, with salt and pepper. 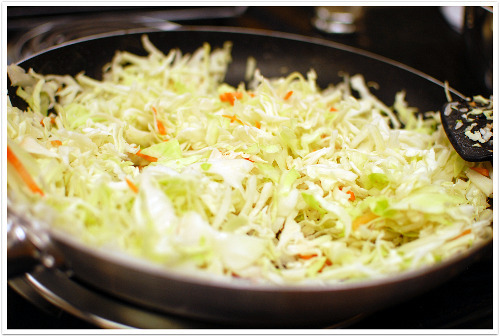 Remove coleslaw mix and set aside. Add water to the same skillet and bring to a boil. Stir in Knorr® Asian Sides – Classic Chow Mein and return to a boil. Reduce heat to medium and cook, stirring occasionally, 7 minutes or until noodles are tender. Stir in pork and coleslaw. Combine preserves with chili sauce, then spread on warm tortillas. 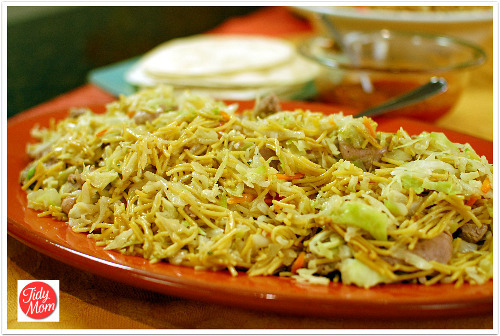 Top with chow mein mixture, then roll up. Serve, if desired, with soy sauce. This dish was DELICIOUS!!! I can’t wait to make it for my family! I think I’m going to try it with chicken. Also, I ate it with out the tortilla, but did spoon the sauce over it. Thanks again to Unilever for the incredible experience. 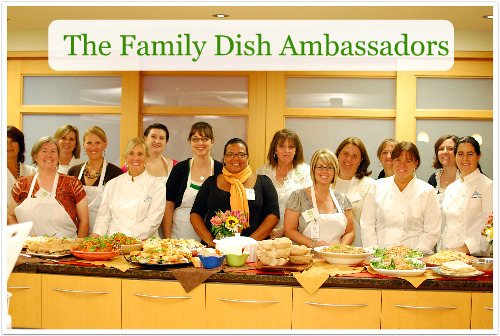 *Disclosure- This post was created in connection with my appointment as an Ambassador in Unilever’s Family Dish Program. For more great ideas, go to www.thefamilydish.com. What a wonderful experience you must have had in NY with Unilever and all the gals. The pork dish looks lovely, as do you of course 🙂 Looking forward to hearing more about your trip this week. Love it Cheryl! Sounds delish! Yummy!! What an awesome opportunity!! I’m so glad you had fun and thanks again for letting me visit in your absence!! 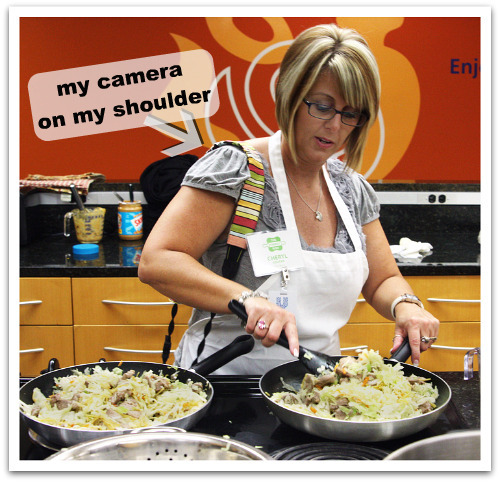 I love that you were cooking WITH you camera on your shoulder! THAT is talent, my friend! That looks like a great recipe, Cheryl! Sounds like a wonderful trip, and a real honor that you were selected!!! That smelled so good cooking! I cannot wait to try this recipe! Thank you so much for sharing it with us….It looks very easy and delicious! You can tell that you are a dedicated Blogger with your camera slung over your shoulder even while you are cooking….=) I look forward to hearing about your trip to NYC and hope that you will have more quick, easy, delicious recipes to share! What a cool experience!! You look good with that camera. lol. That Moo Shu Pork looks yummy. Oh how fun!! This looks amazing. Can’t wait to hear about more!! That looks scrumptious!! Okay I had to giggle a little at you whipping up a dish with your camera hanging off your shoulder 🙂 Too cute girl! YUM! That does look easy – and not a lot of fancy ingredients that I can’t find at our rural grocery stores. What an incredible trip you had! exactly!! My kind of recipe……..easy to make, easy to find ingredients! 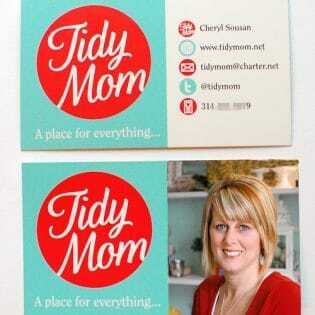 This looks great, Cheryl! I’ll bet you had a great time in NY. How cool! What a cool event. So glad you cooked up some fun in NYC. And a great group–that’s a lot of kitchen power. Uh, YUM! I’m totally making this for my family. Thanks for sharing. Looks like you had a great time – and your recipe sounds delish!